2016/2017 "Boat & Bach" client Draw. Drawn on the 1st of May 2017 from all Skippers who chartered with us during the 2016/2017 season. *Value is based on 6 people at one of our $150/night Bach chartering "Orion" (6.5m runabout with 150HP Mercury) during2014/2015 season. The luck winner cannot use the 2016/2017 draw voucher between the 1st December 2016 and the 18th of February 2017.Please see T & C's page for charter requirements. You can upgrade to you Bach of choice and pay the difference. Please note that your skipper needs to be experienced in handling the boat and the Bach needs an "Approved Mooring". "Orion" is the best of the lot. Powered by a 150HP Mercury with a 15HP aux.Having an enclosed Hard Top you have all round protection from any weather you encounter. 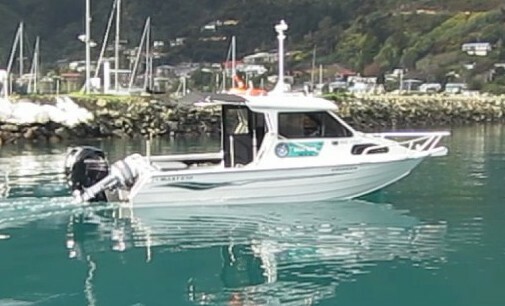 New colour chart plotter, fish finder, washdown pump, stereo, trim tabs, water ski pole, a very comfortable with a fantastic cockpit and all the facilities for fishing. With the 2016/2017 client draw we have a $300 value (2 nights @$150/night)allocated to the bach of your choice.